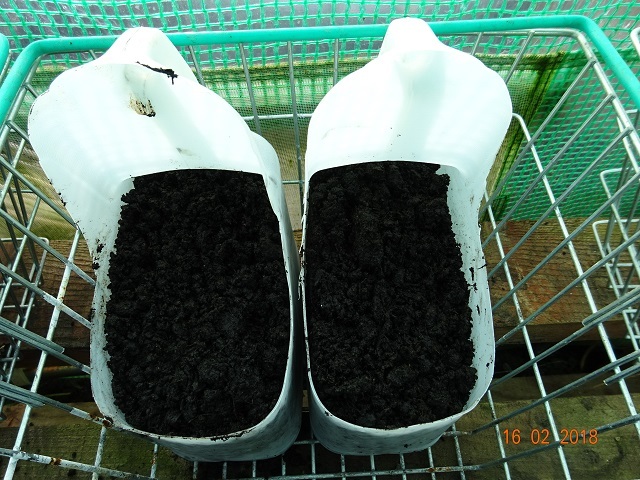 After cutting up a couple of large milk cartons, I filled them up with some of last year's compost and then planted parsley in one of them and rosemary in the other. I don't know how they got here, but moles have arrived at Frugaldom and the pesky little critturs are leaving mounds of soil everywhere! It's not like we have much of the stuff that's easy to access, what with the project being surrounded on several sides by marshland, stream and burn so it is beyond me how these little diggers got here. I tell the grandchildren that a big bird swooped down, grabbed the mole from elsewhere and the mad mole put up such a fight that the big bird dropped it into Frugaldom! Anyway, all that lovely soil has come in handy and saved me the bother of trying to dig through the rocky ground - I just collected the molehills to fill the pots then topped them up with some compost after planting all the red peach stones I'd been given. I now have 10 pots with peach stones planted in them and will hope to get something growing. This is more for the fun of it than expecting to grow scrumptious peaches here in Scotland but who knows? Perhaps a couple of them may mature one day. 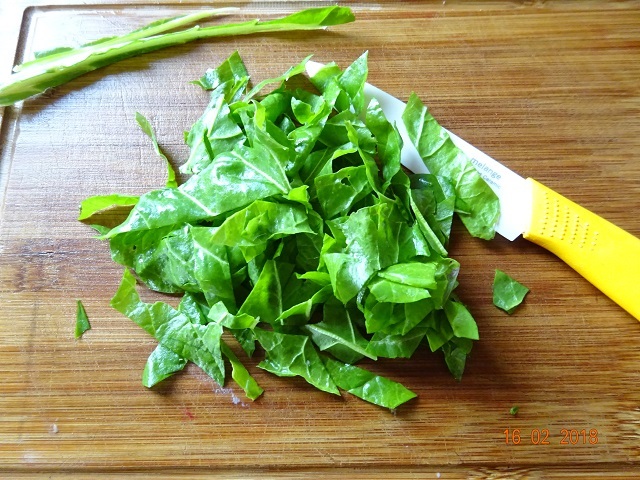 I used to hate spinach when I was young. It was one of those sloppy, green mushes that poured out a can, made famous for it's prized nutritional excellence by Popeye! It wasn't until I fully embraced frugal living as an adult that I saw the benefits of this great plant and discovered how easy it is to grow! This is some I picked this morning from last year's crop that is under cover in the plastic polytunnel. The plants, although not really growing any new leaves at this time, still look shiny and green with the promise of more growth appearing soon. I dug up a root while there and have now transplanted it into a tub on the caravan decking to see if I can get it to grow there. Let's not overlook the most obvious food producers at Frugaldom - our hens. As the days lengthen, more of the hens are laying. 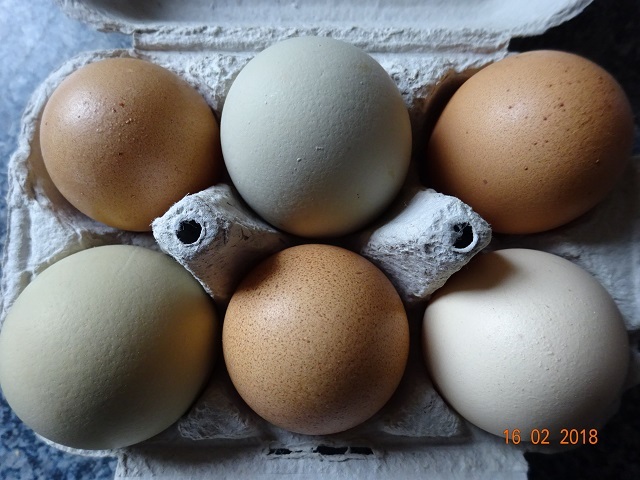 We're now getting four colours of eggs - brown, blue, green and white. I'd say that for now, the bulk of the protein in the my diet is egg based! It's been pancakes galore for the past few weeks but I think a spinach quiche may be in the offing soon. Next, I need to sort out some seeds for sowing. 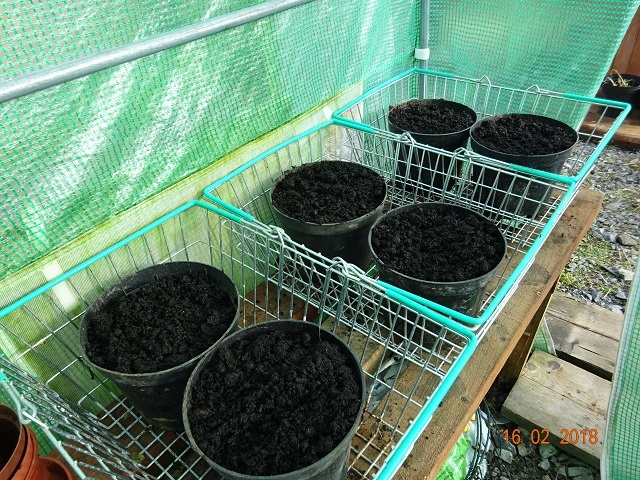 I have just sown the globe artichokes into individual pots in the polytunnel in the hope we get some sunshine soon. I have several small blueberry plants sitting waiting to be planted into the ground, along with blackcurrant cuttings that are already starting to bud up, and I have four tiny grape vines and two hardy kiwis, all waiting to go into the new vinery, as soon as it's built. 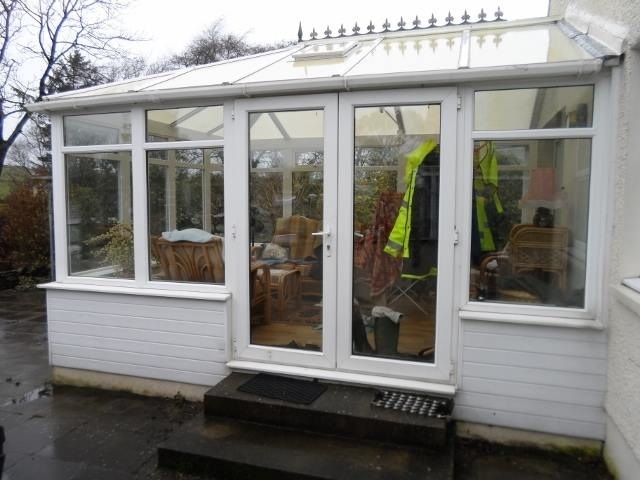 The vinery, assuming we get the necessary permission to construct it, will be made from an old conservatory that we have been offered. Its current owners are having a new one added and have offered us all the glazed units out of their old one, along with the paving around it. We're hoping there will be sufficient slabs for a base and enough glazed panels to do three sides of the vinery, built up against a wooden back wall. If we are able to get some form of polycarbonate roof that will allow the sun to shine through and trap in enough heat to help the vines to grow, it cold be a huge bonus to our growing plans. Don't forget you can visit our new Frugal Living Challenge group linked to the Frugaldom page on Facebook.